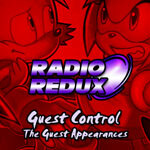 After what seems like forever the first of the Radio Redux Guest Control shows has been added to the Radio Redux stream, a long standing favourite of the SEGASonic Radio archive, the third group show termed the “Clusterf***” by myself was broadcast on June 23rd 2008 – Sonic’s 17th birthday. It’s sort of a crossover of sorts between Urtheart’s Boombox show and Radio Redux as we essentially lead the way but its a great laugh. Rather outrageous in places though – deffinately a Parental Advisory show. The third SEGASonic Radio mass conversation mash-up for Sonic’s Birthday. Join AAUK and Urtheart as they host the chaos – you’ll never think of Marine in the same way again.